There were three talks for the day. 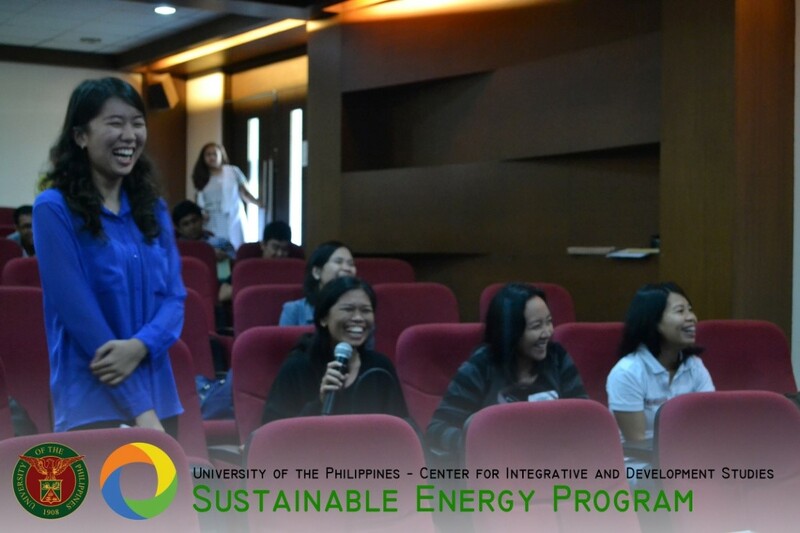 The first was an overview of the electric vehicle technologies by Prof. Chekov Castillo of the UP Electrical and Electronics Engineering Institute – Power Electronics Lab, followed by a discussion on electric vehicles’ carbon footprint in the US by Dr. Mili-Ann M. Tamayao, project head of the SEP, and lastly, a talk by Ms. Yvonne Castro, Vice President of the private company BEMAC which specializes in electric vehicles in the Philippines. After each speaker, an open forum was held as for the audience to ask questions or share insights they have gained from the talk. 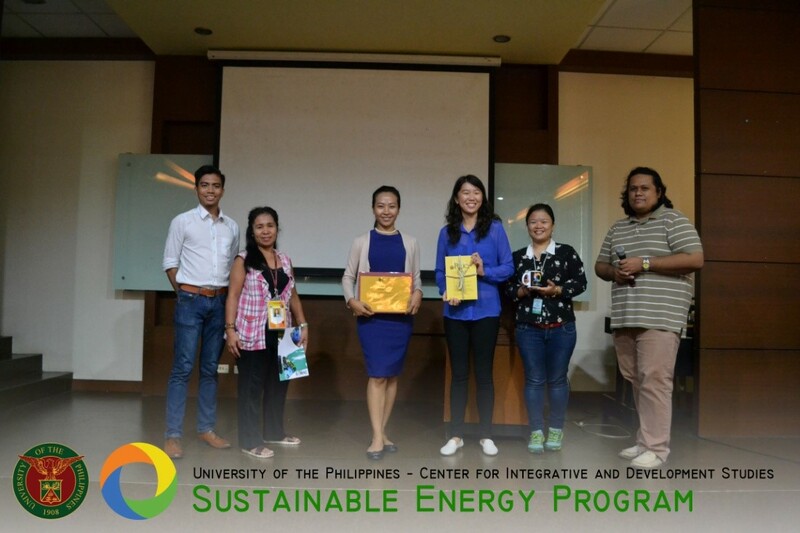 For this SET, the majority of the attendees were graduate students from related fields such as Chemical Engineering and Energy Engineering. 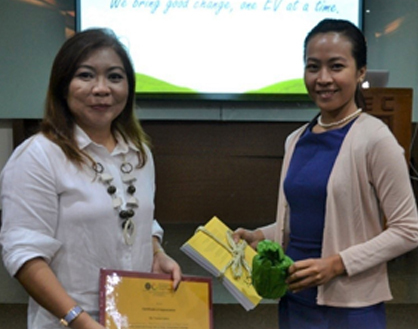 By the end of the program, the speakers were awarded certificates of appreciation. 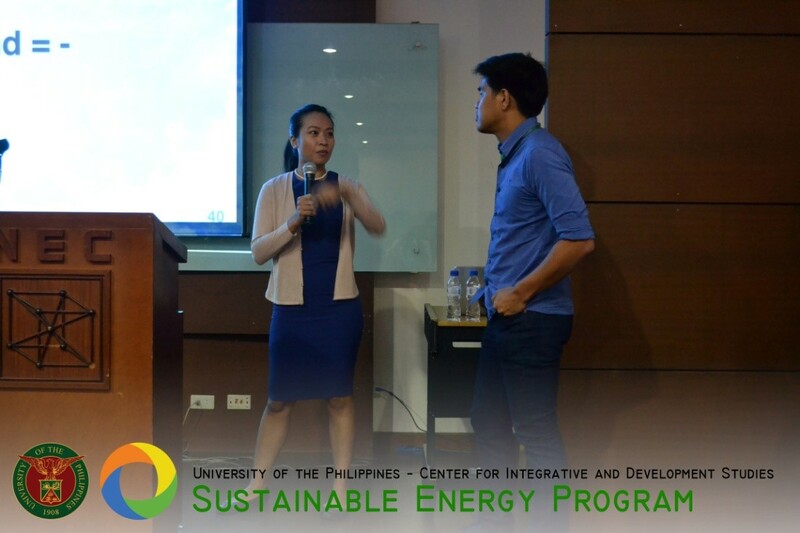 Before the first talk, a brief introduction of the UP Sustainable Energy Program was given by its program head, Dr. Mili-Ann Tamayao. Electric vehicle (EV) technology is not a new concept. In fact, as early as 1830s, Thomas Davenport built the first practical electric motor and in 1880s, Thomas Parker built the first electric car. At first, electric cars were at par and even outsold gas cars by 10:1, until 1910s when Ford made its cars and it started to undercut the sales of electric cars. Further events such as the decrease in gas prices increased the sales of gas cars thus shadowing the electric cars. For a while, electric vehicle sales were buried underneath, until the late 1990s, GM started producing its electric vehicle EV1. However, a few years later, they recalled all their cars from their owners, a move which the CEO of the company admits as one of the biggest mistakes of his career. Come 2000s, electric vehicle industry went on the rise again with companies such as Tesla, GM, Nissan, and other Japanese brands investing in EV technology. An electric vehicle is one that uses one or more electric motors for propulsion. Going by this definition, electric vehicles also cover elevators, escalators, and forklifts. However, for this talk, electric vehicle include pure electric vehicles and hybrid electric vehicles. In a pure electric vehicle, the battery is used to store power, which is used by the motor, and to charge the battery, it is plugged into an electrical outlet. On the other hand, in a hybrid electric vehicle, an internal combustion engine (ICE) or other propulsion engine is used. It is not limited to diesel and gasoline – some variants use fuel cell instead of ICE. It also has a battery, which is charged either on-board or through regenerative braking. This is different still from a plug-in hybrid, whose main source of energy is the battery, and similarly, can be charged by on-board or regenerative braking but could also be by plugging into an outlet. An important component of a car is its powertrain. When comparing electric vehicles, we are actually comparing their powertrain, or the components that conduct the vehicle’s power from the original source to the road. For a motor electric vehicle, the powertrain includes the engine, transmission, drive shock, differential, and what is known as the final drive. For cars, the final drive also includes the differential, by definition. The process involves starts with the engine mixing fuel with air, compressing it, igniting it, and causing a linear motion in the pistons. The engine converts it to rotational motion, then it goes to transmission, then to the differential, which controls the difference in the turning of inner and outer wheels when turning. For a battery electric vehicle, the transmission is gone. The power goes from the battery, to the controller, to the motor generator, and into the differential, thus turning the wheels. The efficiency of a battery EV could further be increased by removing the differential and replacing it with two motor controllers for each wheel. However, such setup would require additional work in creating a sophisticated electronic differential. Hybrid electric vehicles (HEV) could further be classified into mild HEV and full HEV. A mild HEV basically increases the efficiency of the vehicle by turning off the engine during idle moments, (i.e. stop traffic), wherein power is just lost, where for full HEV, it is otherwise. A full plug-in HEV removes the engine, thus removing the inefficiencies associated with it, and uses only a battery as the source of power. So the efficiency increases in going from mild hybrid to full hybrid. The main benefit that we get from EVs is the efficiency. It is imperative to analyze how much power is transmitted from the fuel to the road for two setups – the motor vehicle and the HEV. For a motor vehicle, once the fuel gets into the engine, only 16% goes out. 76% goes to mechanical loss and heat due to friction, and 8% goes to standby loss. The 16% is available for the drivetrain, which incurs additional 3% loss, thus, the power available to the wheels is 13%. Further, 3% is lost as aerodynamic loss and 6% is lost due to braking. Overall, the from the 100% energy of the fuel, only 4% is used to roll the tires. This is the case for a stop-and-go city driving. If we look at a highway driving scheme, the figure is slightly higher – you use 7% to roll your car. 81% is lost from the engine to the drivetrain, 10% aerodynamic loss, and 2% braking loss. That is why car manufacturers provide two mileage figures – one for city driving and one for highway driving. Looking at an EV, the power available to drive the car is 35% – a much higher portion. Going further to mild hybrid, it removes the 8% standby loss. And going further to full plug-in, it would eliminate the engine entirely and further increase efficiency. Looking at the emissions of the car, we can also do the analysis by looking at fuel production or energy generation to use phase. For a gas vehicle, fuel is produced in an oil refinery plants which has a typical refinery efficiency of 82%, 98% transmission efficiency, and 16% car efficiency, having a total efficiency of 13%. Whereas, for an electric vehicle, generation efficiency of 33% and transmission efficiency of 94%, having a well-to-tank efficiency of 31%. Further multiplying with the efficiency of the car, we get a well-to-wheel efficiency of 23%, which is 10% higher than the gas car. It can be noted, however, that this efficiency increases if we change the source of power from a fossil-fuel based plant to a renewable energy source. Other components of the electric car include the electric motor, which has several types, including the brushless DC (BLDC) motor, brushed DC motor, and induction motor. Efficiency-wise, BLDC motor is the best, followed by brushed DC motor, and induction motor (although high-efficiency models are also available). Another very important component is the motor controller, which governs the behavior of the motor – it controls the speed and torque, and protects the motor and the battery from damage. Another critical component for EVs is the Battery Management System (BMS), which basically monitors the battery’s state of charge (SOC). It is critical especially for those that use lithium-ion batteries, because it avoids overcharging of batteries which may cause defects and worse, explosions. For lead-acid batteries, it is not much of a risk because overcharging only leads to generation of H2. Another critical component is the charger. Specifications must be followed for lithium-ion batteries to avoid overcharging. Another is the engine control unit, which communicates with the motor controller to control the engine. Lastly, general power supply for auxiliary power systems must be also included. Auxiliary services are headlights, airconditioning unit, etc. While EV technology is promising, some challenges are yet to be addressed. For one, gasoline fuel is highly-efficient, as compared to battery. Another challenge is the long charging time, which could be addressed by fast charging techniques, which is the focus of one research in the Power Electronics Lab in UP EEEI. Another alternative is battery swapping, where battery swapping stations will be installed such that vehicles would be able to change their batteries with new ones. This could also address the problem with the high initial cost for the customers, because 30% of the initial cost goes to the battery. 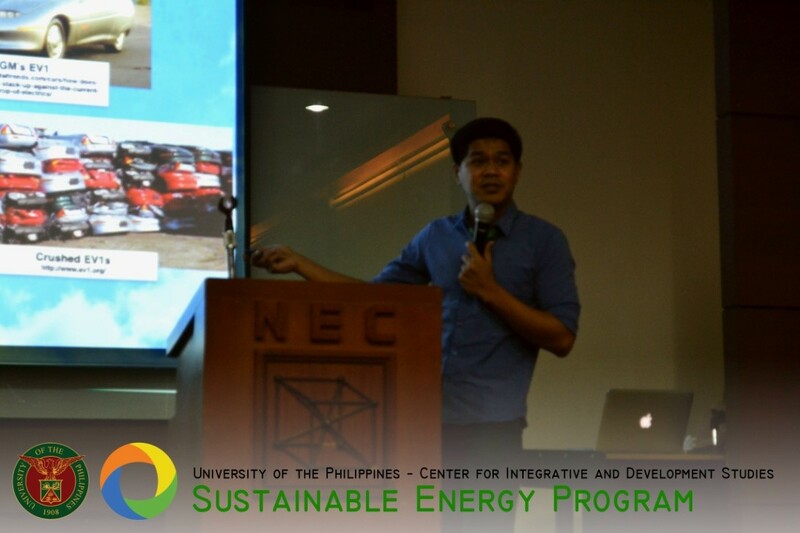 For EV projects, Prof. Castillo was involved mainly in Shell Eco-marathon. He was part of the team that made Kidlat in 2011, the first electric car that the PEL made. It is a diesel electric hybrid designed for battery and ultracapacitor energy storage. For 2012, they skipped the diesel category and went to pure electric vehicle. They went from a brushed DC motor (as Kidlat’s design) to a BLDC motor. Their vehicle logged a total of 74 kilometers per kWh. For 2015, they made Kislap 2, which had a slightly lower mileage at 40.5 kilometers per kWh, but won because it became the sole finisher in the race. And in 2016, they made the most road-legal car yet, logging a mileage of 62 kilometers per kWh. Another vehicle that they are developing is the PHANTOM (Philippine Hybrid Land Transport Optimized for Metro Manila), a project in partnership with DOST and DOTC. It is a proof-of-concept bus vehicle for a new CVT transmission, and it is intended to be used in EDSA. Another research is trying to look at producing locally a motor controller of BMS with authentication. It is being funded by USAID-STRIDE. The problem they are trying to address is, aside from developing local industry, is to support battery-swapping system for EV implementation. Do Electric Vehicles Have Lower Carbon Footprint? The presentation of Dr. Mili-Ann M. Tamayao is based on two studies, the first entitled “Regional variablity and uncertainty of electric vehicle life cycle and CO2 emissions across the United States”, made by herself together with Jeremy Michalek of the Vehicle Electrification Group at CMU, Chris Hendrickson of the Green Design Institute of CMU, also Ines Azevedo of the Center for Energy and Climate Decision Making. The other work is entitled “Effect of regional grid mix, driving pattern, and climate on the comparative carbon footprint of gasoline and plug-in electric vehicles in the United States”. This research was sponsored by three main institutions – UP ERDT, Toyota Motor Corporation, and the Center for Climate and Energy Decision Making through the National Science Foundation and Carnegie Mellon University. There are three key takeaways of the presentation. The first one is that electric vehicles actually do not always result in lower energy consumption and/or CO2 emissions. The second one is that life cycle CO2 emissions reduction benefits of electric vehicle depend on several factors including grid mix, temperature, vehicle type model, driving pattern, and driving distance. And thirdly, we have to clean up the grid first and install enough charging infrastructures if we are to maximize the benefits of electric vehicles. The studies mentioned were based in the context of US and talks about the importance of CO2­ emissions. CO2 emissions actually surpassed the 400 ppm mark of the Keeling Curve, which monitors the global atmospheric carbon level since the 1960s. This poses a number of risks, as scientists have predicted that once we reach the 500 ppm mark, extreme catastrophic weather changes will happen. The context of the study is in US because, for one, US is the second highest emitter of CO2 in the world (next to China). Transportation accounts for about 30% of these emissions, which is also about the same for the Philippines. Also, there is a sustained energy policy in the US as electric vehicle sales have been steadily increasing, although still a small number – 1.5% of light-duty vehicle sales. In other countries like Norway, the figure is higher – around 10% or even higher. This is partly due to its environmental policies and high reliance on renewable energy for its power sector. EVs basically play a role in reducing CO2 emissions and mitigating climate change. Another value for using electric vehicles is health. Use of EVs could lower the particulate matter emission from current gas vehicles. This is also a more local and immediate concern, compared with climate change mitigation which is a global concern. Thus, if we put more electric vehicles on the road, air pollution will be lessened and pollution-related respiratory illnesses could decrease. In the US, the Clean Cities Program is implemented to promote the purchase of plug-in hybrid electric vehicles by subsidizing the purchase of EVs, and by investing in public charging infrastructures. Public charging infrastructures is actually one critical aspect of a vehicle electrification program, and a question was raised as to whether we are capable of doing it in the Philippines as well. Participating cities in the Clean Cities Program are also the most populated. Identification of these areas would further be used in the analysis. The parameter with which vehicles will be evaluated is the vehicle miles travelled. The vehicle models that were used in the analysis on the other hand are Nissan Leaf, Chevrolet Volt, and Toyota Prius Hybrid Electric Vehicle. Of the three, only Nissan Leaf is the full-electric type; Chevrolet Volt is also a plug-in hybrid. The vehicles were analyzed on different regions in the North American Reliability Corporation, which is a grid system for supplying power in the North American region. In the analysis of carbon emissions, the framework also classified the United States into different counties, because different regions have different sources of energy and different vehicle miles travelled and driving patterns. This is what marginal emissions factors consider that average emissions factor miss. Average emissions factor takes the aggregate carbon emissions for the whole country and divides it by the total number of vehicles, ignoring the variability in local conditions. Moving on to the results, regions were identified where it is more environmentally-benign to use Nissan Leaf (electric vehicle) than Toyota Prius (hybrid). While some areas show that indeed using EVs decreases carbon areas, a particular area, the Mid-West Reliability Organization, suggests otherwise. This region heavily relies on coal for their power and most of the plants are old, and it was found that using EVs might actually cause more CO2 emissions. There are also regions where it is inconclusive to say which of the two vehicles are better. BEMAC is the leading electric vehicle industry in the Philippines, making up almost 98% of total electric vehicle sales in the Philippines. This is due to the fact that EV industry in the country is on its infancy, and some companies are not yet into commercial distribution of units. BEMAC is a daughter company of Uzushio Electric Company, a company based in Japan which originally specializes in shipping. BEMAC aims to take part in controlling air pollution and mitigating climate change. In the Philippines, there is a study by UP National Center for Transportation Studies (UP NCTS) that tricycles and motorcycles contribute to 45% of total volatile organic compounds, while a sizeable amount of air pollutants in the air are caused by public transportation. So as part of its corporate social responsibility, BEMAC is looking into ways by which they can help the environment and at the same time help those in the lower strata of the economy. The company’s main product is the 68VM, an electric tricycle run on lithium-ion batteries and includes a vehicle control unit (VCU), a feature that monitors every aspect of the vehicles, especially the battery. They take pride in being the only company in the Philippines to have such feature on EVs. This is especially critical in vehicles with lithium-ion battery, because overcharging a lithium-ion battery could destroy it or worse explode. One of the company’s current deployment of 68VM is in Boracay. Their target customers are tricycle drivers, as per the Boracay LGU’s initiative to gradually phase out conventional tricycles in the area. It has been proven that, in spite of some of the island being flooded for most time of the year, the tricycle could safely traverse them without damaging the internal parts. They have also made their own charging station in the area. When asked about their business model, BEMAC partnered with Metrobank to provide loan service to tricycle drivers to help them purchase the units. It has been proven successful so far. Another area of interest is UP Diliman, wherein BEMAC partnered with UP Diliman officials and UP NCTS to test their product in the campus. It is a two-way process – the campus benefits by employing additional transportation service within the campus, and BEMAC collects data gathered from the activities of the vehicles. 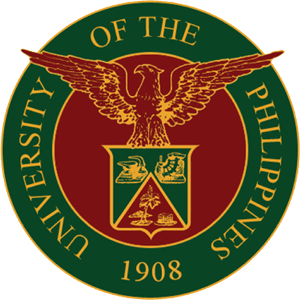 The initial timeline for the project has already been completed, but UP Diliman officials have requested for an extended use of the units and the company eagerly agreed. As of now, data collection is still on-going as well. Other large scale involvements of the company include the partnership with the Quezon City government, which is funded by Japan International Cooperative Agency (JICA) where the company has turned over 20 units already. The biggest yet, however, is the Asian Development Bank – Department of Energy (ADB-DOE) project, where the company is contracted to make 3,000 units, to be deployed in Manila. They have been working tirelessly to produce 500 units a month, as they are only given six months to accomplish the contract. 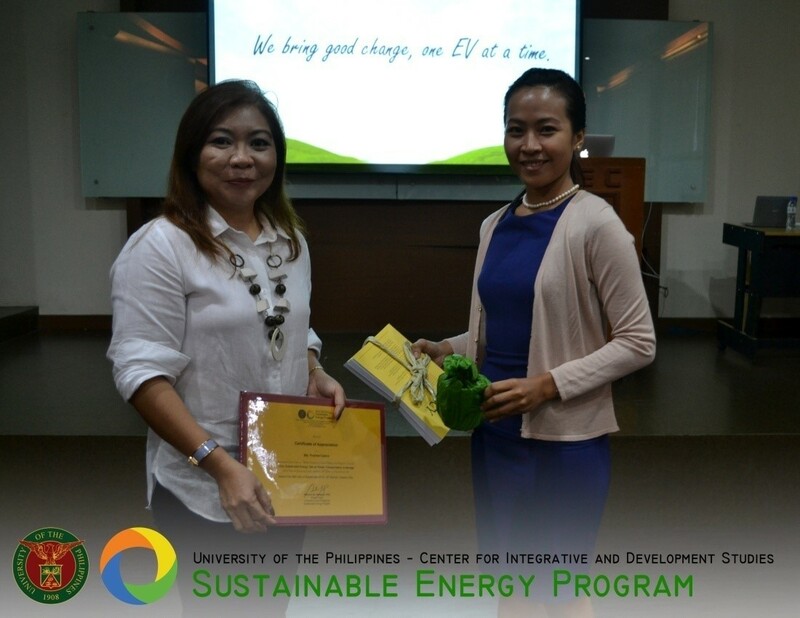 Two professors from the College of Engineering of the University of the Philippines gave a public lecture on energy storage last October 9, 2015. This was to give an appreciation and better understanding to interested individuals as well as to encourage students, both undergraduate and graduate level, to pursue this field of research. Dr. Rinlee Butch Cervera and Dr. Joey Ocon both discussed their current research efforts on energy storage. 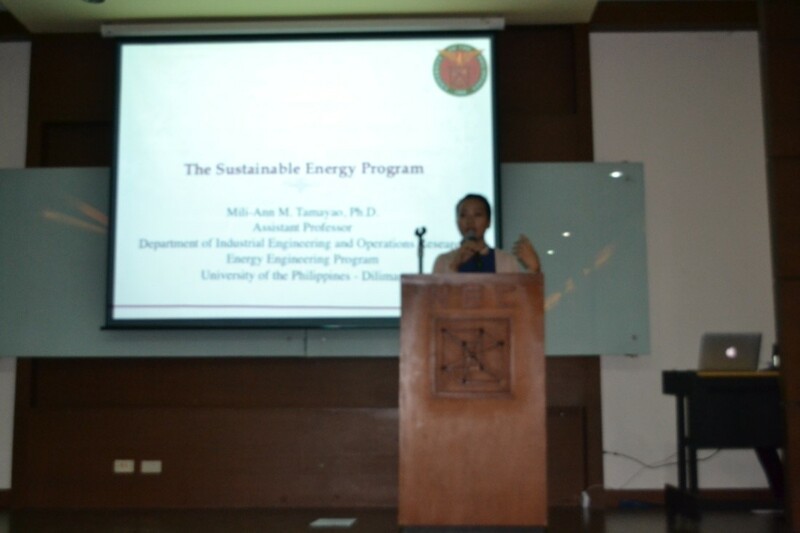 Dr. Cervera first gave an introduction on what energy storage is, and its importance in the power sector. He then proceeded to discuss one of the types of energy storage in which he does research on – batteries. Batteries are the oldest form of energy storage which can be classified as either Primary, which can only be used once; or Secondary, which are rechargeable. Dr. Cervera’s research focuses on replacing graphite as the anode material in a battery with something which has greater capacity. One material which is being explored is silicon which has a capacity which is 10 times greater than that of graphite. 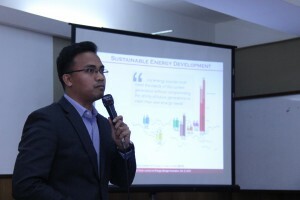 Lastly, he discussed some applications of energy storage as well as another form of energy storage which is hydrogen energy storage in which excess energy for RE can be used to split up water into hydrogen and oxygen with the former being stored and contributed into the electricity grid. Dr. Ocon began his lecture by giving an interesting figure that if the world were to turn off the overall supply, there would only be 33 minutes worth of electrical energy stored. He mentioned next the roles of energy storage which are: 1) to reduce electricity costs; 2) improve the reliability of the power supply; 3) maintain and improve power; and 4) solve other problems such as excessive power fluctuation and undependable power supply. 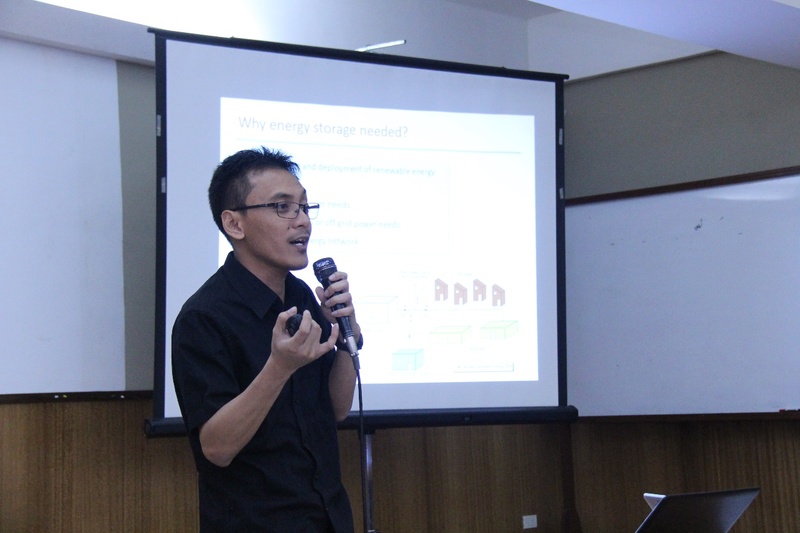 Next, he discussed Chemical Energy as a one of the long term solutions in energy storage. 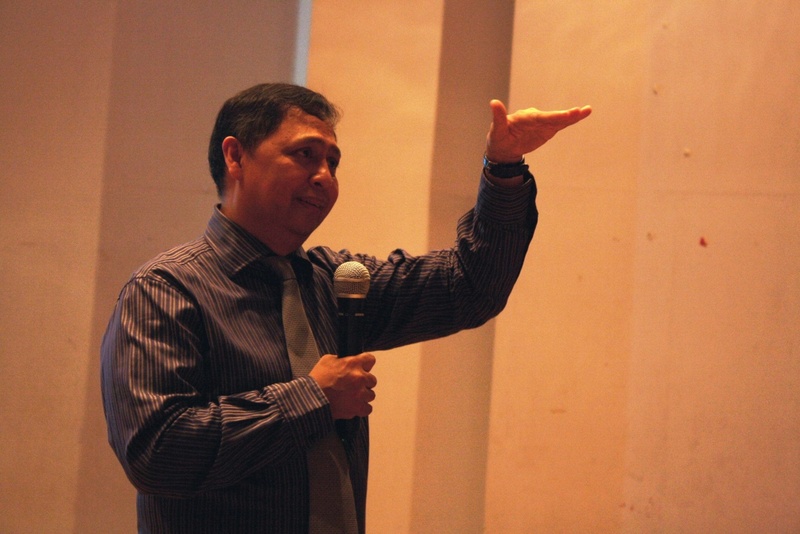 He discussed two key fields of research which he is involved in: Electrochemistry and Catalysis. Electrochemistry is the conversion of chemical energy into electrical energy and vice-versa and Catalysis is the acceleration of chemical reactions by a catalyst. 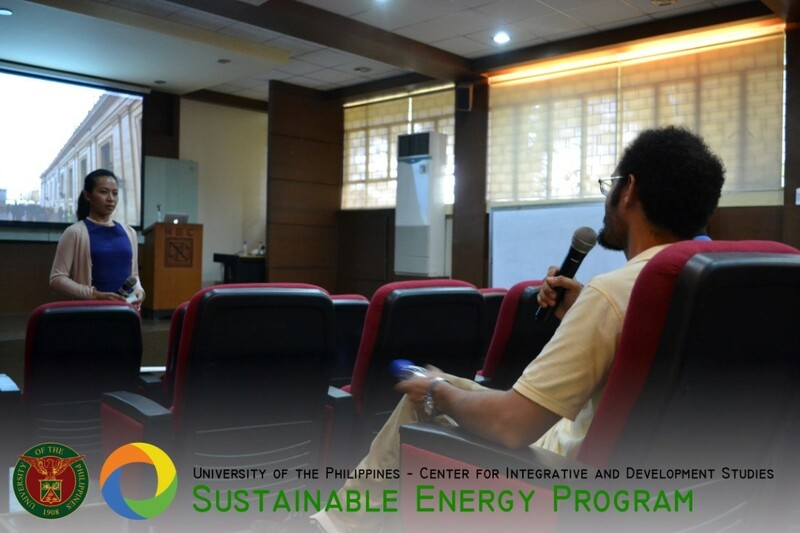 Dr. Ocon proceeded to the uses of energy storage in the Philippines which do involve batteries as well as pumped hydrogen storage. He concluded by mentioning several references if anyone was interested in reading more on energy storage. Professor Rowaldo del Mundo of the University of the Philippines said that the high electricity prices in the country can be reduced by up to 20% by ensuring the security of supply. 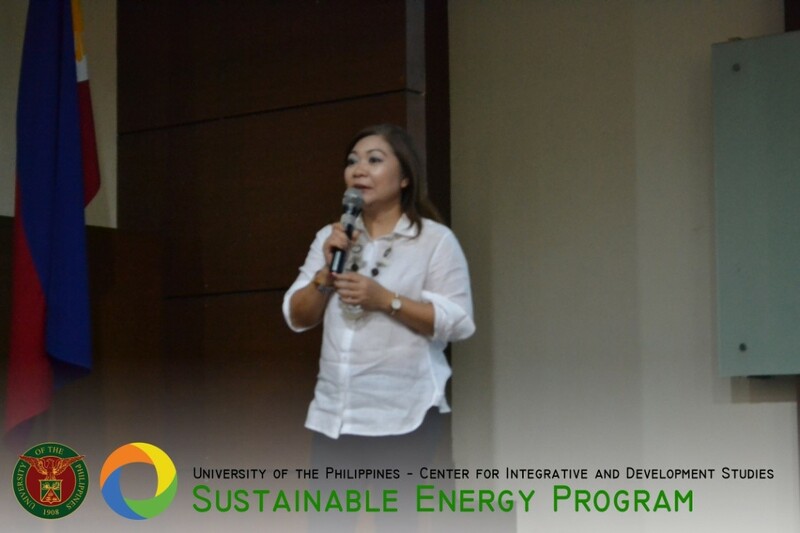 In a public lecture held last April 16, 2015, Prof. del Mundo explained that the reduction of power rates can be achieved by aggregating the power demand of electric cooperatives and letting them go through a competitive and transparent process of procuring power supply contracts. Read more on this at: http://cids.up.edu.ph/professor-says-high-power-rates-can-reduced/. 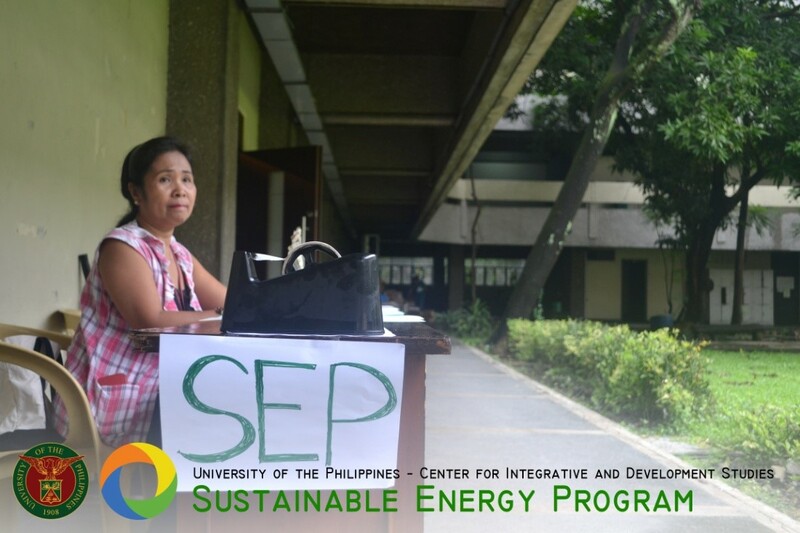 Prof. Del Mundo talks about how power rates in the Philippines can be reduced. Credits to Diane Ruth Riñon Arcega.